The following is the tenth and final message that we received in Egypt this past March 2012 over Equinox. You can find our other messages on our website at www.alunajoy.com under the "Articles for Personal and Planetary Transformation" link. It might be a good idea to read them in order as each message builds upon the previous one. We are sharing this message here with you just as we received it, in present time, with very little editing. We do this for a very important reason. We know that the messages that we receive are not just for our groups, but are for others as well. The Atlantean/Egyptian Masters and the Star Elders assure me that the message and the corresponding energy will be transmitted to you. So as you read this, you might want to imagine that you are with us. Also, always view the photos on the website that we share, as photos also hold some energy of the sites. Aluna: For those who didn't hear the message yesterday, I will recap here…. What the Atlantean/Egyptian Masters and the Star Elders were doing (yesterday in the innermost shrine of the Great Temple at Abu Simbel where statues of The Keepers / Creator Gods were seated) was bringing energy from the source of creation through their crown. The energy proceeded down to their laps, and then the energy was projected right off their laps right to us. A lot of us were feeling discomfort below the belly button, in the hips, and across the back. This is because we were rebooting. Then we were interrupted by the guards. There was one other piece that I got after we had to walk out. (Raphael shares) What Aluna said earlier today was that a lot of us were feeling really fuzzy headed and unclear, and part of that fuzziness was explained when the Star Elders popped up and told her that they are keeping us out of our heads so that we would keep open in order to receive what's coming next. Whether we receive what's coming tomorrow or in the future, she didn't know. But we are being asked to stay out of our heads (thus feeling fuzzy), so we can receive this energy properly in the center core place of creation that is inside of us, not in our heads where we usually store things. (Aluna continues) So to recap… those four seated statues in the Holy of Holies (the innermost shrine) represent the four directions, and the main (Holy of Holies) alter stone is ether. Ether is going to be essential when we start developing, or creating, in the next dimension. With ether added, we will be able to manifest anything, including time / dimensional travel. Anything our minds can image we can create. Each of us will be able to achieve this level of creating (and those reading this series). Ether is not solid and is something we presently misunderstand, so this is why we are feeling fuzzy. Anytime we learn something different or new, it can feel fuzzy as our mechanical minds don't know what to do with it yet. So this fuzzy feeling will happen as they download ether into us. Did everybody have a chance to stand in front of the Holy of Holies and absorb some of the energy? (Use Photo to feel the energy here) The Star Elders said they know us, so it does not matter if some of us didn't hear what I said yesterday. They know who we are. So if you stood there, you received the energy; and if you are feeling a little fuzzy headed now, this is probably why. Ether is misunderstood and highly under-used by most people in this earthly dimension. The Atlantean/Egyptian Masters and the Star Elders have known how to create with ether throughout this current age (104,000 year cycle). It is important that we enter into this new dimension using the right frequencies and focus. This is why so many people are traveling to sacred sites and working on their spiritual path so adamantly. It really is important that we get off on the "right foot" incorporating the right frequencies and holding a clear focus. In our first days into the upcoming new age we will be qualifying, or encoding, the new cycle with what we are feeling right now. This will be our foundation stone to build upon. There is another fun thing we learned about a cosmic orientation while in the Temple at Abu Simbel. I pulled out my iPhone. I was faking, in part for the guards, so I could snap some pictures. Also I just had a hit to determine the orientation / direction of the temple. But something strange was happening with the phone and its built-in compass. When I opened my iPhone compass application, the screen went blank, showing only a dot in the middle - very weird. I asked if anyone in the group had a normal compass because an iPhone, being electronic, does not work magnetically but uses GPS. It is well known that sacred sites are impacted by magnetic forces. Apparently Abu Simbel has some stuff going on. So I exited the compass application and turned it back on, and the screen was blank again except for the center dot in the middle. It was wildly moving around looking for north and didn't find it. The screen stayed that way, until I went outside of the sacred site and completely rebooted my iPhone. Then I realized that the Atlantean/Egyptian Masters and the Star Elders were trying to show me that they were giving us the cosmic orientation point in a blank space that has been created inside of us. That dot in the middle of the iPhone compass application was them saying… this is your center. Remember that this blank space inside of us was created at the Kom Ombo Temple. This blank, or empty, space was necessary before we could be filled up with pure unqualified, creative force at the Philae Temple. It was here that we started feeling a bit fuzzy. Then there needed to be a qualifying point of orientation, (center point / foundation stone) from which to start building a new world. We received that orientation point yesterday in Abu Simbel where the Atlantean/Egyptian Masters and the Star Elders told us that this was their way of informing us we were being rebooted with a new orientation point. Never before have I ever had any sacred sites or any beings in sacred sites manipulate technology in this manner to impart a message. 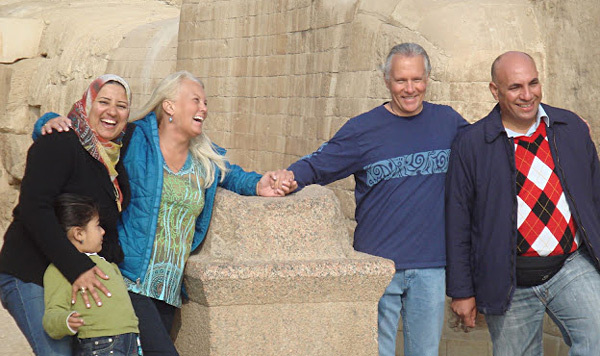 Twice on this trip we have received inter-dimensional messages through technology, including all the orbs in photographs at Karnak with Sekhment and yesterday in Abu Simbel. At both Philae and Abu Simbel, the Star Elders and all the other Masters and Guides have been putting us in a holding pattern for something we will receive tomorrow (The Kings Chamber at Giza). This is why we are feeling rather "fuzzed out" and not quite grounded. The unqualified, pure, creative energy force (that has been downloaded into us) and the orientation point (the center point) all will be activated tomorrow in the Kings chamber at Giza. Well we will see how that goes. Everything else has evolved beautifully as though it were planned before we even arrived here. There has been an extraordinary progression of events from day one. (read past messages for more about this) First we had the Goddess Sekhmet talk to us in Cairo, saying: "Come home." Then we were able to gain access to Sekhmet's Temple at Karnak, where Sekhmet gave us a job. Then we went to Edfu and picked up the old Atlantian energy from Set. Then at Kom Ombo, we dumped out this outdated and mis-used Atlantian energy, together with freeing innumerable trapped souls. This left an empty space to be filled in later. That space was filled when we went to the Isis Temple in Philae. The energy that we received at Philae was unqualified pure energy, but it lacked an orientation point so we could not use it yet. So, tomorrow we will have our new energy and a new orientation point, and then we will see what the grand pyramids and the Kings Chamber have to offer us. 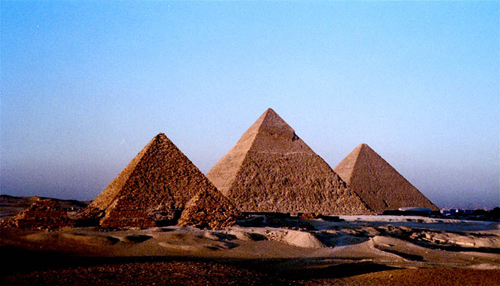 For those of you that have never been in the Great Pyramid, there is no energy there. There is nothing at all. It's clean, clear, empty. We are going in at pre-dawn, so any residual energy from visiting tourists from the day before will have been cleared out overnight. What matters is what we take IN the Great Pyramid. So I would like offer some suggestions here…. As we enter the Great Pyramid tomorrow, let's stay in our heart center, in gratitude and thankfulness and any other good, positive feelings that we can keep alive inside ourselves. Also, please remain quiet for some time to feel the place and allow the energy to build inside the chamber. It takes a while to build up, and we will just wait and see what develops. We will take our crystals and other sacred objects and put down a cloth in the middle of the room. We can setup and do anything we want. We will let Spirit guide us when we get there in the morning. Spirit has been doing a pretty good job so far directing our pilgrimage. Be sure to get some good sleep tonight. For the first 30 minutes, the group was quiet to feel the energy of the space. We sat and meditated and were in a state of Be-ing in total darkness. Some saw dimensional doors opening up. And other could actually see in the dark! Then I went through one of the dimensional doors. I was not aware of this until I was snapped back into my body and let out a huge gasp. I was afraid I had scared the group. I know I scared myself. : ) I remembered nothing of the other side, much to my disappointment! Immediately, I tried to get back inside… but once we begin to TRY… we have lost. Trying only pushes away what we want because the universe sees us trying and gives us more TRYING. Post note: Sometimes we can enter other dimensions and not know it, but only are aware of it once we return. Now, for the first time, I felt a presence inside the King's Chamber: I saw Thoth and Sekhmet follow me back into the King's Chamber. They both went right for the essence bowl we had set up in the sarcophagus. We feel that the sarcophagus is an Ascension Activator. No remains were ever found there. Now we are going to bring the energy we have built up in this chamber down into our hearts. They want us to hug. Come closer. The sound of the heart is "O." And when we say "O," it vibrates in the heart. So let's say "O" three times with our new power: "Oooooooooo…. Oooooooooo…. Ooooooooo." (We invite you to do this at home, as well.) Are you feeling a pressure around your heart? That, the heart area, is what they are working on right now. The Atlantean/Egyptian Masters and the Star Elders want us to feel, to experience, the love we feel for our group, for this journey, the things we have learned from each other, and the bonding. Love is a powerful force. They want us to appreciate and feel this love that we have had together, and the love we have for all the people that have helped us on this journey. They want us to feel this LOVE and fill this chamber with this love until it is so thick that we could swim in it, like swimming in sweet honey. (we invite you to do this at home, as well.) The room is filling up with nice, sticky, sweet, all-consuming love from the core of who we are - from our past, our present, and our future. I feel the presence of the Hathors, and they are overlaying on all of us. I look at all of us, and we have Hathor faces. It looks so sweet: they are sending us this amazing love, but they are saying: "Are you going to come back?" The whole pilgrimage has been about this theme and question, are we going to come back? So they are asking us (and those reading this) to make a commitment to coming back. "Come back," they say. Where have you been? Come back." They are not asking us to come back in time. They are asking us (you) to come back HERE to this presence of LOVE that is who you really are. Here and now back to yourself. Come back all the way. Be committed to coming back all the way. Come back into your heart, into your power, into your light, into your mastery, all the way. Are you committed? Are you ready to be here all the way? Sekhmet asks us to come back. Now the Hathors are overlaying us with this beautiful, sweet heart energy while saying, "Come back. Come back." We have our feet on the ground in this chamber, right? We have our heads reaching into the stars in the portal above us. They ask us to come back all the way to the PRESENT MOMENT and into our AUTHENTIC SELVES. This is the space in which we can create anything - by being REAL and being HERE and using the living energy. Now… at the same time, we need to ask them to come back to us, saying: "Where have you been? Come back." We need to build a bridge between our star family and us. We ask this from our past . . . the present . . . the future. Through all time, space, dimensions - through body, mind and spirit - come back dear family. Come back. All the guardians that we connect with . . . Horus, Sekhmet, the Hathors, Isis, Maat, Thoth, The Immortals, etc. . . . come back. We are here. We are waiting for you. We have a job to do. We came here to get the job done. It's our destiny . . . their destiny . . . the planet's destiny . . . humanity's destiny. Thank you.